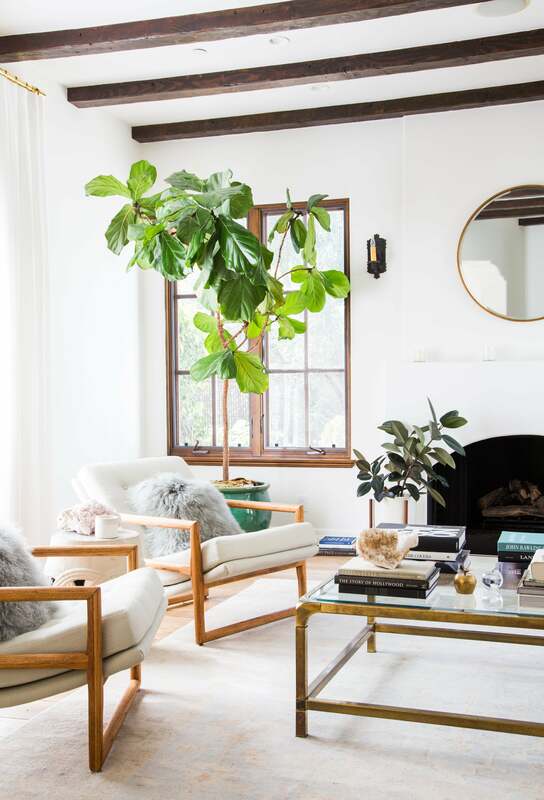 Though the perpetually Instagrammable fiddle leaf fig plant manages to look effortless when styled beside mid-century furniture and bohemian-inspired vintage rugs—this plant famously takes real effort to keep alive. To get every tip and trick on how to care for the finicky trees, we spoke to Erin Marino, the Director of Marketing for The Sill (one of our favorite NYC-based houseplant shops); and Baltimore-based artist and dedicated plant collector Hilton Carter, who’s been caring for his first fiddle, “Frank,” for over five years. The fiddle leaf fig houseplant (fiddle or FLF for short, but technically speaking, the Ficus lyrata) is native to Western and Central Africa. Though the fiddle can grow up to 50 feet in the wild(! ), there are two common sizes you’ll find in most people’s homes (and sold on The Sill). The first variety, a bushy-looking type, will grow to be around three to four feet tall. The second type, a taller, trunked fiddle, is likely to be five to seven feet tall. Sure, you can buy fiddles that range from one to 10 feet in height, but generally speaking, those are the two most common silhouettes. They’re all the same species, they just grow differently. Worried your fiddle might graze the ceiling? Don’t be. “It’s almost impossible to recreate those tropical conditions inside your apartment, so don’t fret about a Jumanji-like situation arising,” says Marino. While you may want to bring some green to your interior in colder months, do not—we repeat, not—get one in the winter. Since their natural climate is tropical, transporting a fiddle and exposing it to even a few minutes of cold air can be detrimental to its health. Marino advises buying and transporting your plant when it is above 50, preferably over 65 degrees just to be safe. Rule number one: Transplant your fiddle leaf to a new pot from its original plastic one. “Plants that are potted live longer, happier lives because they have better access to water, and their roots can continue to grow and not be pot-bound in the black plastic grow pot,” says Marino. Look for a pot made of a substantial material, such as ceramic, stoneware, terra cotta, or fiberglass. It should be two to three inches larger in diameter than your fiddle’s plastic pot. (Marino says bigger pots tend to lead to overwatering, which is a no-no.) Drainage holes are great, but not necessary. While drainage holes might not be necessary, adding the right rocks to the bottom of your pot will help. This will both protect the plant’s roots from excess water sitting in the bottom of the pot and absorb it. Marino recommends lava rocks mixed with gravel because of their porous qualities. You need to water your fiddle once week. Half a liter is good for the larger fiddles and a bit less for the shorter, bushy guys. Another thing to remember: The air gets very dry in the winter, which is not at all like their natural habitat. Fake humidity by misting your plant with water once a week—you can do this year round, but especially in the winter. This can be done at the same time you water your plant. If you’re still not sure how often you should be watering your FLF, remember that your plant will tell you when it’s ready. A fail-proof indicator that your green friend is craving some H20? “You know an FLF is ready to be watered by placing your finger about two inches deep into the soil. If your finger comes out dry, it’s time to water. And you should water your plant until water drains into the base tray,” says Carter. Pro tip: Always remember to empty your base tray, as sitting water can cause root rot. Taking care of houseplants requires more thought than placing them directly in or out of the sunlight. The fall and winter months can be tough for a fiddle. That’s why during the grow seasons (aka spring and summer) it’s important to fertilize your FLF—and your other greenery, too—to ensure it regains its strength and necessary nutrients. Fiddles take a few weeks to acclimate to their new homes. Marino says the FLF is pickier than other houseplants and that you will be able to tell if it’s unhappy very quickly based solely on its appearance. Give your fiddle extra attention until you’re sure it has adjusted. The Sill recommends checking in with all of your plants every three to four days, just to make sure they’re doing well. That way, you catch signs of distress early and can easily nurse your plant back to health. Carter might be a seasoned FLF parent now, but that doesn’t mean he didn’t make his fair share of mistakes along the way. There were a number of moments over the years where he thought he was going to lose Frank for good. No matter how excited you are to take on an FLF, consider holding off on bringing one into your home until you’ve settled down somewhere permanent. Fiddles grow slowly, so don’t worry if you don’t see immediate growth. Green leaves signal you have a healthy plant on your hands. If it receives plenty of sun and the proper care, you should expect for your fiddle to grow its entire life. “We say true success with a plant is when you need to eventually repot it in a larger pot,” says Marino. When it comes time to repot your fiddle, the season doesn’t matter, just as long as you stay indoors. Repotting in the early spring (right before the FLF’s growth season) is preferable, but not required for a successful transfer. Pro tip: Make sure to rotate your plant so it grows evenly—not lopsided. Think of your fiddle like you would a pet. You need to love and care for it, pay attention to how much you feed it, and take action if it looks sick. Falling off: Water more—your plant is most likely under-watered. Browning: Give your plant more sunlight—it’s not getting enough. Yellowing or lightening: Water less—leaves should be a nice dark shade of green. Clipping browned leaves isn’t necessary to the health of your plant, but it will make it look prettier. There is one appearance-related matter that is important—dusting. Be sure to dust your fiddle often, as dust particles prevent your plant from absorbing sunlight. Marino compared the dust sitting on your fiddle’s leaves to leaving your makeup on—except for instead of just clogging your pores, you’re preventing photosynthesis and transpiration from occurring, which is basically like starving your plant. Lightly spraying your fiddle with water, using a feather duster, or wiping leaves with a soft cloth are all great ways to keep your plant clean and healthy. If you’ve given your fiddle all the love and care you can, but you’re pretty sure it’s dead, Marino shared when to officially throw in the towel. When over 50 percent of leaves have changed color. When your plant has lost over 50 percent of its leaves. When it no longer uplifts you with its appearance because it looks damaged and unhealthy. Purchasing a fiddle leaf fig is an investment. Before you spend big on your plant, know that most last a few years (if cared for correctly). If you’re an overachiever, know that they can last much longer, too. “We’ve heard plenty of stories of houseplants passed down through generations,” says Marino. Did we hear someone say #lifegoals? Look for a colorful succulent or a unique cactus. They need little water and are easy to care for. Think about getting a snake plant or ZZ plant. They’re both very low-maintenance, but can grow to be sizable. Have fun! Though you should keep your fiddle near and dear to your heart, it’s important to remember that it’s just a plant, and if you follow these instructions, you will be fine. This story was originally published on February 4, 2016 and has since been updated with new information. Need help caring for your other plants?